MicroMD leads the industry by providing advanced e-prescribing features in addition to the more familiar capabilities like instant prescription routing and streamlined refill management. At the point of care, MicroMD EMR can help you verify prescription eligibility, identify formulary-compliant drugs, notify you when a prescription is taken out of stock and show you what medications other physicians have prescribed for your patient. Access your patient’s prescription coverage details through MicroMD EMR. For scheduled appointments and prescription requests, MicroMD EMR automatically retrieves the patient’s prescription eligibility information and presents it to the provider at the point of care. Review a list of the medications that other providers in the community have prescribed for your patient. 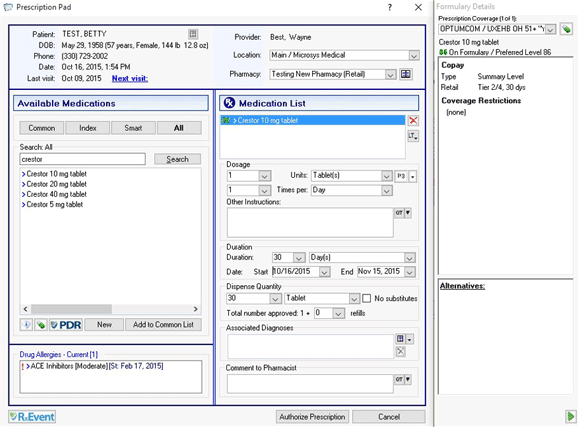 MicroMD EMR gives you a comprehensive view of all medications, regardless of the prescriber. In line with the ARRA/HITECH Meaningful User requirements MicroMD EMR provides Medication Reconciliation functionality to assist practices in adding existing prescription records to the patient’s chart. Once prescription records are received (via Surescripts), MicroMD EMR identifies prescriptions that are not present in the patient’s chart, and allows “single-click” entry of those medications, easily reconciling medication records. Select the most affordable options and enhance adherence to drug treatment by accessing patients’ drug formulary data as a routine, integrated option while writing the prescription. Utilizing a secure and live connection with Surescripts®, the country’s largest electronic prescribing network, MicroMD EMR gathers the necessary prescription coverage information to determine what the patient can expect to pay for the specific medication and, if necessary, identify alternatives. Use the system as a clinical decision support resource. At the time of prescription writing, MicroMD EMR automatically reviews the medical record for potential allergic reactions and checks current medication guidelines, from First DataBank®, for possible harmful combinations. Improve the patient experience with on-demand patient education materials directly from MicroMD EMR. Print instructions, explanations about possible side effects, and other medication-related information, all written with minimal jargon and difficult-tounderstand terminology. Transmit your prescription instantly, through the Surescripts network, to more than 95 percent of all U.S. retail pharmacies. The prescription will be ready when the patient arrives at the pharmacy. The Surescripts network also accomodates 5010 coding and claim checking, as well as verification of patient-paid prescriptions. For practices pursuing the Medicare E-prescribing Incentive Program, let MicroMD EMR automatically add the required “G” code to ensure your claims are properly submitted. Reduce the number of phone calls and faxes related to the refill authorization. Whether from the patient or pharmacy, physicians or authorized providers use MicroMD EMR to return approvals or denials in seconds. Electronically prescribe controlled substance medications in your MicroMD eRx workflow. 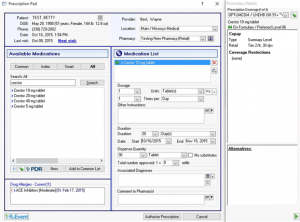 MicroMD EPCS Gold enables prescribers to legally write prescriptions for Schedule II through V drugs to retail or mail order pharmacies electronically, easily and seamlessly within their normal MicroMD eRx workflow. EPCS will help prescribers reduce drug abuse, drug diversion and “doctor shopping.” This makes prescribing more cost-effective, efficient and safe, as well as advances patient medication adherence, increases convenience for your patients, minimizes DEA number exposure, and reduces potential prescription errors. And, by transmitting electronically, there are no more paper prescription pads to purchase, nor will you need to worry about prescriptions being stolen, altered or forged.